In the morning of your tour, travel by coach two hours west from Tokyo to Mt Fuji, Japan's highest mountain. Drive up the mountain, admiring the stunning scenery as you make your way to the 5th station, the highest point on Fuji that can be reached by vehicle. Hop out for 30 to 40 minutes of free time to enjoy the views, take photos, browse the gift shop or visit one of the restaurants, if you wish. 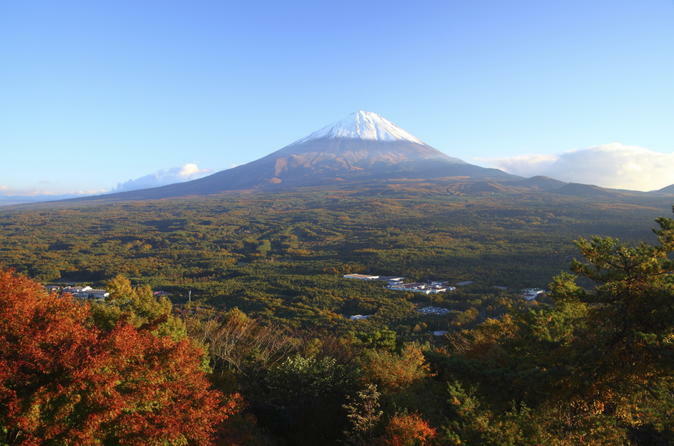 The second half of your day trip begins as you head to Aokigahara Forest, aka the Sea of Trees, located at the base of Mt Fuji. Known for its unusual topography due to its volcanic makeup, the forest is home to above-ground tree roots, exposed lava flows, scattered chunks of volcanic rock and caves created by volcanic gas that collected below the ground and then exploded. With your guide, enter the Narusawa Ice Cave, covered year-round by ice. This cave is off-limits to the public, so you’re only allowed to enter with your guide. Walk carefully over the wet, uneven, sometimes-icy surfaces, marveling at the ice formations deep in the cave. When you leave the cave, you’ll be dropped off at the Fuji-Q Highland amusement park bus stop, where you’ll catch the bus back to Tokyo. Your bus ticket is provided by your guide, and your seat is already assigned and reserved, so don’t worry about waiting in line. While you wait for the bus, you can buy souvenirs or snacks at the concession stand, or check out the amusement park entrance, which is home to a large gift shop where you can buy candy and local wine or even enjoy a round of bowling (you may have an hour or more of wait time, depending on when you leave the cave). The approximate 2-hour bus ride ends in Tokyo’s Shinjuku precinct, a vibrant shopping and entertainment area that will be busy and lively when you arrive — a great way to end your night! Please note: Views around Mt Fuji are always subject to weather conditions, as mountain weather is notoriously unpredictable. Visibility tends to be better during the colder months, in the early morning and late evening.